93% are more normal than you! 5% are more of a loser than you. Luckily I don't believe in tests. I agree with Wouter. If you post links to sites where you need to register, can't you supply us a link to login data or even better links where you don't need to register at all? If you didn't noticed it: It is xfce4 (a gtk based small Desktop environment), with a KDE icon theme, Aqua / MacOS X like window decorations and a color scheme inspired by the "OS which must not be named". 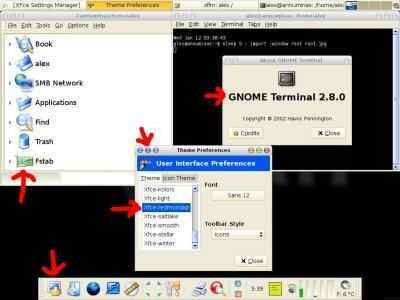 Oh, and before I started using screen in a normal xterm, I always used the GNOME terminal. Seems to happen every time I get near the magic 365 days. Being new to blogging, I'm still wondering, what's that thing about memes, and out of curiosity I tried planets last meme (still thinking, that I won't blog about it). There is a nice, new meme, the musical russian roulette, others on planet Debian have been playing: fire up your music player, set it to shuffle, and note the first ten songs it plays for you. I'm surprised! Neither a song from The Beach Boys, nor The Blues Brothers. And WHY do I have the dutch version of Aquas Barbie Girl? I DON'T like Aqua, and I don't understand dutch! Oh, now that I see a song from my Classic Disney Volume II CD: I still have Volume I as cassette - but I never owned a cassette player (don't ask me, why I bought a music cassette without having a cassette player. It's a looooooooong story.) If anyone has the possibility to create oggs of it, please send me a mail! Erich blogged about the fun he had during his visit of the consulate of USA in my home town Frankfurt. Perhaps you feel better, if I tell you, that it isn't fun to have them between our university campi (or is the plural of campus campuses?). Don't try to go from on campus to the other via the shortest way passing the consulate in a group of six long haired students without valid identity cards shortly after the USA became victim of a terrorists attack. Not funny. The How To Write Unmaintainable Code will ensure, that you can't be fired, since nobody can maintain your work. And finally something Debian specific: The eye catcher project made some progress. Shortly after the mention in the Debian Weekly News and an announcement (in which I set a broken reply-to), the mailing list has 13 subscribers and we created a first prototype. The prototype works... somehow... but it's far from being perfect. Most of the time I spend working around missing features of magicpoint. It has no real includes, so I use m4 to do some includes before running the presentation. I has no "run in an loop until I press a key" mode, so it is run in a while-true-endless loop. You need to end it with <ctrl>+<c>, so it won't clean up. The presentation is called again and again, so it flickers a bit between the end and the restart of the presentation. Yes, I know what you thinking: Why didn't you used OpenOffice.org for it? You wouldn't have any of those problems! Although OpenOffice.org documents are basically just some xml files, it seems not be easy (for me) to track changes and work in a community on a document. Magicpoint slides are text files, you can put them in a cvs repository, and the current design allows a translator to just create an additional directory, translate some text files (without any layout entities), and run it at an exhibition in his own land in his own country without knowing anything about magicpoint. However: If you know a better way to do this or knew a solution for any of the problems, feel free to join us, or please send me at least a mail. Thanks. Thanks for reading this far, and thanks to Andreas, Jörg and Gerfried for giving me some advice in blogging and creating my hackergotchi, and thank you Mako for all your nice blog entries.